Are We All Charlie Hebdo? Yesterday, when the news broke of an attack by masked gunmen on the Paris office of satirical magazine Charlie Hebdo, the Internet—that worldwide repository of timeless wisdom and oh-so-well-thought-out status updates—was soon plastered with the #WeAreAllCharlie hashtag and its many variations (#IAmCharlie, #JeSuisCharlie, #NousSommesCharlie, etc). When I saw it, I instantly thought back to Le Monde's famous September 12, 2001 editorial "Nous sommes tous des américains". Many also shared the hashtag out of solidarity with the victims. But statements that some posted alongside the hashtag imbued those simple words with wildly differing meanings: an impassioned defense of free speech, a battle cry for embattled secular values, a simple statement against violence, a denunciation of Islamist terrorism, a cry of French national pride... The reasons people shared those words were infinite. Charlie is dead, the whole world denounces this supposedly "terrorist" act yet all the while thousands of Palestinians and Iraqis (women and children) die each day and nobody says a thing. I am strictly against all sorts of violence and I'm not ok with what these pseudo-Muslims have done today, but #iamnotcharlie. That statement, like others I have seen today, is messy and draws some questionable parallels. But I have seen the pain that exists in this part of the world, and on which such statements draw. That resonates with me, but it doesn't tell me where I stand. I'm left wondering: What does it mean to "be Charlie"? Am I Charlie? Freedom of expression is dear to me. I come from the United States, a country with relatively fewer limits on free speech than even many fellow established democracies (many of which censure Holocaust denial or other offensive speech). In many less tolerant environments, I have often found myself defending America's obsession with free speech to the bitter end. Several years ago in Rwanda—a country with strict speech limits that it justifies as necessary to avoid a return to genocide—I remember debating these principles with several Rwandan friends. I cited the then-current example of the Westboro Baptist Church, arguing that their right to picket soldiers' funerals as some twisted statement against gay marriage—though at once baffling and hideous—was nonetheless an essential part of our democracy. But does defending some wackos' right to free speech mean that I identify with their message? Absolutely not. The same goes for Charlie Hebdo. The magazine's cartoonists, writers, and editors poked every eye they could reach. Nobody was spared their profane treatment (though they sure didn't poke them all equally). Was some of it funny? Sure. But a lot was also far too offensive for my taste. I question Charlie Hebdo's taste, not their right to publish. I question their intentions: Did they seek to poke fun and expose hypocrisy, as all good satire does, or sometimes to malign and hurt? I'm not so sure. I will defend their right to publish, but I'm not quite comfortable "being Charlie". This is the uncomfortable in-between at which I have arrived in my reflection thus far. There is more thinking and debating to be done. Whether "we're all Charlie" or not, what happened yesterday in Paris was reprehensible. That it is provoking some important thinking and conversations on intercultural relations and identity may prove valuable. But I fear that within Europe (and perhaps beyond) this event will also stir some dark forces that feed off the enmity generated by such attacks. Middle East scholar Juan Cole shared an important reflection to this effect yesterday, calling it a "deliberately polarizing atrocity" engineered by, and to the benefit of, extremists on both sides. Dark days ahead. We've arrived at a zero-sum game for the (often Islamophobic) defenders of French laïcité [secularism] and the increasingly globalized movement of radical Islam. The crime is heinous, the response will be also. 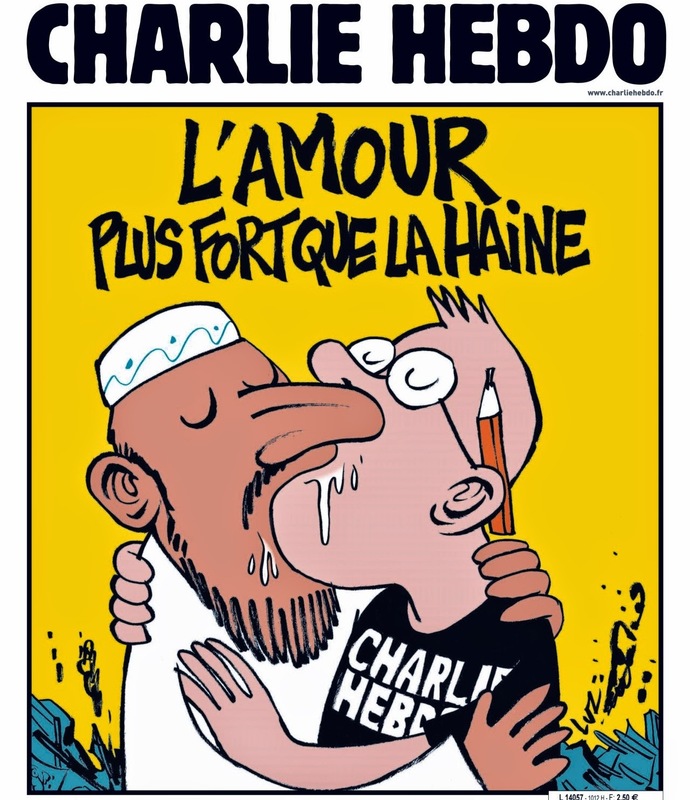 Let us hope that "L'amour", as Charlie Hebdo's most famous cover put it, will prove to be "plus fort que la haine". Let us also work, in our own daily lives, to make that a reality. "Making insulting cartoons about white people who controlled the power structures was not the same as demonizing black people — a powerless underclass." "This isn’t ambiguous, though: the editorial staff of Hebdo consistently aimed to provoke Muslims. They ascribe to the same edgy-white-guy mentality that many American cartoonists do: nothing is sacred, sacred targets are funnier, lighten up, criticism is censorship. And just like American cartoonists, they and their supporters are wrong. White men punching down is not a recipe for good satire, and needs to be called out. People getting upset does not prove that the satire was good. And, this is the hardest part, the murder of the satirists in question does not prove that their satire was good. Their satire was bad, and remains bad. Their satire was racist, and remains racist." "I am offended when those already oppressed in a society are deliberately insulted. I don’t want to participate. This crime in Paris does not suspend my political or ethical judgment, or persuade me that scatologically smearing a marginal minority’s identity and beliefs is a reasonable thing to do. Yet this means rejecting the only authorized reaction to the atrocity. Oddly, this peer pressure seems to gear up exclusively where Islam’s involved. When a racist bombed a chapter of a US civil rights organization this week, the media didn’t insist I give to the NAACP in solidarity. When a rabid Islamophobic rightist killed 77 Norwegians in 2011, most of them at a political party’s youth camp, I didn’t notice many #IAmNorway hashtags, or impassioned calls to join the Norwegian Labor Party. But Islam is there for us, it unites us against Islam." I don't think we are all Charlie. I'm a non-believer but I don't think Charlie's caricatures were all that funny. I knew about them, thought they were more offensive than anything else, but I still am Charlie in a sense, because, living in Algeria, I am well aware of the fact that I really shouldn't express my ideas to anybody, let alone do blasphemous caricatures (even if not really offensive). But muslims aren't Charlie, in the sense that they're not the ones threatened in case they want to satirize the prophet... simply because they won't do it. I would still recommend muslims to show solidarity with the victims instead of saying it was all just an act, or that "they had it coming". You should be more vocal about your condemnation of the act, and your solidarity with your the victims. Thank you for taking the time to respond, Infinity8. But I don't think it's helpful to look at this incident in such sweeping terms, or to have such distinct expectations of what people of one group "should" and "shouldn't" do. This is not a simple issue to face, and I believe those who see it as one are missing the picture.